USA and Bolivia are trying again to normalize diplomatic relations after seven years of estrangement and the reciprocal expulsion of ambassadors. An attempt comes just several days after the historic Summit of Americas, where the rapprochement between the US and Cuba has been witnessed. The US business representative in La Paz, Peter Brennan, met with bolivian Foreign Minister David Choquehuanca to talk about the next steps. "We want to improve relations with Bolivia We talked about how we can do this and the steps we can take; about our directions, specific areas in which we can work, areas, in which we have mutual interest" Brennan said as he left the meeting that was held in the Foreign Ministry. "From our side there is a great desire to improve the relationship and we will continue working on this, I hope the government of Bolivia, President Morales has this same desire, so we will be working," Brennan said. 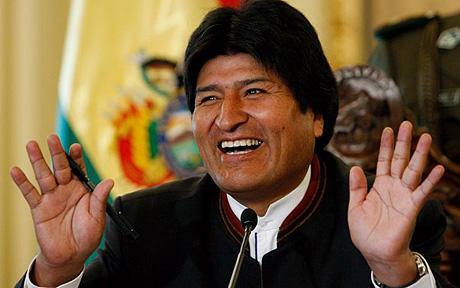 Bolivian President Evo Morales has been a strong critic of the United States since coming to power in 2006. It was he who ordered the expulsion of US Ambassador Philip Goldberg, whom he accused of supporting an alleged plot against him, and later the Drug Enforcement Administration, DEA has also been accused. Choquehuanca revealed last December that La Paz proposed Washington to organize a meeting between Presidents Evo Morales and Barack Obama to direct bilateral relations.